A one-pot, hearty Italian-tasting soup for chilly, rainy days. Preheat the oven to 350 degrees. Combine all ingredients for meatballs in a large mixing bowl. Roll beef mixture into medium-sized balls and place onto a baking sheet. Bake them for 30 minutes or until cooked through. In a large soup pot, heat olive oil on medium heat and sauté onion, mushrooms, celery, and garlic, adding salt to taste. Cook gently for several minutes until onion is translucent and liquid from mushrooms has cooked off. Stir in red pepper flakes, diced tomatoes, and broth. Let simmer for 15-20 minutes until veggies are tender. 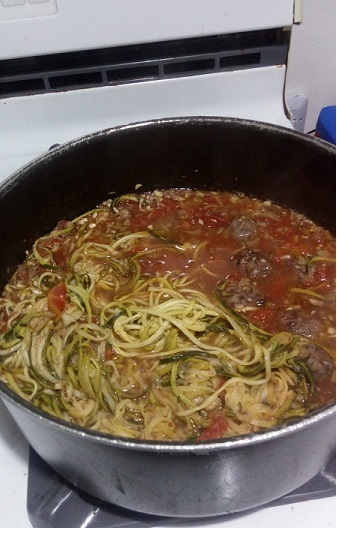 Add zucchini noodles and meatballs and cook for another ten minutes until zucchini is tender. Serve hot.